The great thing about Roland’s legendary x0x series of gear is that the numbers also lend themselves nicely to dates - earlier this year, we took March 3 and August 8 as opportunities to celebrate the TB-303 bass line synth and TR-808 drum machine. Today is September 9, or 9/09 - it’s time to check out the TR-909. Compared to its younger siblings the 808 and 606, the 909 featured a harder sound - the kick was more of a “thud”, while the snares had a louder smack. 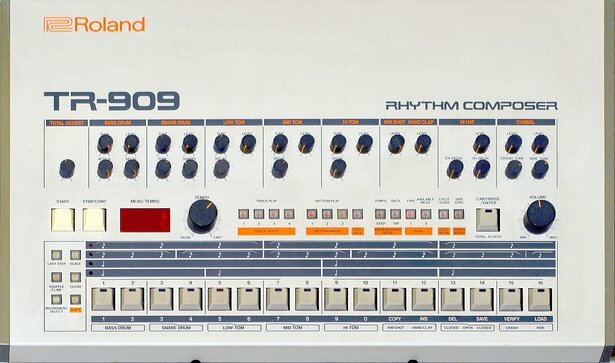 In addition, the 909 was part-digital and part-analog, featuring sampled sounds for the hi-hats and cymbals. There’s some of our 909 favorites - what about yours? Let us know on Facebook, Twitter, or Google+. Got any tracks that you’ve made with the 909 Drum Rack from Drum Machines? Let us know too, and don’t forget to use #MadeWithLive.